A couple of days ago I received my brand new Lenovo ThinkPad L520 laptop, and after using it for a couple of days I am really impressed with it. While I’ve been having trouble installing and keeping Ubuntu stable, the hardware itself is fantastic. I got my first laptop 5-6 years ago, it was a second-hand ThinkPad R40. It was, and still is, a fantastic laptop – although it’s quite slow and clunky now. Around 3 years ago I decided the R40 was too old and bought a new laptop: a ThinkPad T61 (the T-series are the top-of-the-line models, while the R-series are the ). Another fantastic machine. It was another tough, well built laptop, and it also looked really nice (imho). But three months ago, it died. The graphics card basically melted – a known design flaw with the NVidia chip and board design (I don’t think Lenovo or NVidia decided whose fault it actually was). I wanted to replace my T61 with a new T420, but it was going to be $3,000+ which I couldn’t afford, so I decided to wait and save up. But recently Lenovo had a sale on, and I noticed the L520. The L-series replaced the old R-series, and although they aren’t as thin or as styled as the T-series, I was still very interested. I checked the price for a fully-spec’ed machine, and got $1,000 with the discount. So I decided to buy it. If you’ve seen a ThinkPad before, you know they are all black plastic, full of straight lines often with diagonals in the base, and lots of people think they look boring as they have very little (if any) “shiny” parts. The L520 is no exception, it’s made out of the usual high-quality non-shiny black plastic, it has the weird diagonals under the front and side, and I think it looks very professional and non-fancy (my way of not saying boring!). There is no brushed metal or shiny plastic anywhere, which is another plus. Oh, and the most important part about a ThinkPad is the keyboard: it is, yet again, the most comfortable keyboard I’ve ever used (my R40 & T61 were the same), and it features the TouchPoint in the middle – the little red dot which is a mouse. 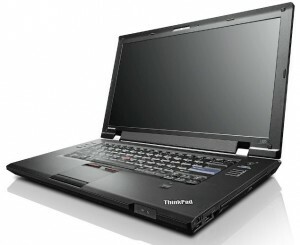 There is no mistaking it, this machine is a true ThinkPad. The black plastic that it’s made of is high quality plastic. It feels solid and comfortable under my hands, and has little give when pressure is applied. I’m sure you’ve handled some laptops which felt like they were going to break if you aren’t careful – this isn’t one of them. It feels solid and strong, and I have no doubts I can apply as much pressure as I like and it will take it. The screen hinges are huge and have been well designed, opening and closing the screen is very easy and smooth. There are no latches keeping it closed, but the little indent for the Battery and Suspend lights give an easy opening point. The keyboard is fantastic. It’s the same design and feel as previous ThinkPads, and as such feels great. The keys are all in the right spots (except for the F-keys row, which will take some getting used to), and have feedback when you press them down. I’ve been using these keyboards for years now, and I was able to instantly able to touch-type on this one. Under the keyboard is the trackpad, which is the one part of a ThinkPad which has never worked well – they have never made a decent one and as a I result I’ve never liked using them on any laptop. I’ve tried this one, and it feels ok. It’s large, responsive, pretty accurate, but I still keep brushing my palm across it when typing. So I have it turned off. Sorry Lenovo, you’ll have to keep working on that one. Luckily, the L520 still has the TrackPoint which is, in my opinion, the best mouse/pointing device ever invented. Most people hate them, but that’s because most people have never used a ThinkPad TrackPoint, they’ve only used a bad attempt at copying it by another laptop maker! These things are great, they provide super accurate pointing and make it very easy to move the mouse around. One of the reasons for this is that they are located in the keyboard, so your hands never have to move from the keyboard to use the mouse – unlike the touchpad which requires moving the hand off the hand-rest. Without these, it wouldn’t be a ThinkPad. I got the T520 because it was the smallest model with the 15.6″ HD+ (1600×900) screen. The 14″ models have a 14.0″ HD (1366×768), which in my opinion is just pathetic. As a developer, I hate these new super-wide screens – vertical space is really important to me. My old T61 had a 14″ 1200×800 screen, and there were times when that wasn’t tall enough, so I wasn’t going to downgrade to a shorter screen. As a result, I had to get the 15.6″ model. Since it’s a super-wide screen, this laptop is quite wide (it only just fits into my laptop bag). There are large borders around the keyboard, into which they have put the volume controls (left) and the indicator lights (right). It weighs almost 3KG, which is pretty heavy compared with a lot of laptops, and it is noticeable when you put it in a bag or carry it around for a while. But it’s not excessive, given it’s size. Since I’m a big guy, the weight isn’t a problem to me, but it would be for a small person who wants/needs a light laptop. It comes with Windows 7 installed by default, with all the usual ThinkPad utilities. I generated the Restore disks (incase I need Windows on it in the future) before proceeding to install Ubuntu… and failing. Ubuntu wouldn’t install without using some boot options. My theory is that there is some new hardware component/design/change in the L520 which isn’t yet supported on Ubuntu/Linux. My hope is that this will be resolved in the upcoming 11.10 release, but if not, hopefully next year. For now, it’s enough to say that when Ubuntu is running, it’s very fast and responsive and looks great on this screen. Keyboard LED Light – the T-series has a small LED in the top of the screen which shines onto the keyboard to light it up at night (when you turn it on). This is a fantastic feature, and I spent many nights using it late at night. I already miss it. I really like this laptop. It looks great, feels great, and (mostly) runs really well. As a replacement for my T61, this L520 is almost perfect. If you like your ThinkPad’s, but can’t afford a new T-series, then give the L-series a go.